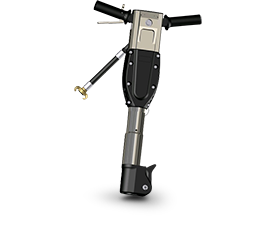 We offer pneumatic breakers to compressors – chipping, pick hammers and paving breakers of weight categories from 5 to 40 kg. Paving breakers: medium heavy to heavy breakers with a “T” handle for demolition works in the construction industry. These are distinguished by their simple robust design offering high performance and an effective noise damper. The minimum number of components extends service life and reduces maintenance requirements. BB20 and BB25 models have handles, which significantly reduce the vibrations transferred to the operator.